Who is Emily? In kindergarten, I had a friend named Emily who had the most beautiful long hair. She was astonished that I walked to and from school every day instead of driving. After kindergarten, she moved away. This is not that Emily. In elementary school, my mother used to baby sit my classmate Cathy’s family before and after school. She had a very young sister named Emily, who was just a baby at the time. It’s amazing to look at pictures now and see how much she’s grown up since then – sometimes people just don’t age in my mind if I don’t see them often. This is not that Emily. In middle school, there was a girl named Emily who was in G.A.T.E. with me. She was a year older than me, and was always so nice. She started dating a guy who I used to have a little crush on who was also a year older than me. Ten years later, they are still an adorable couple. This is not that Emily. When I went to Camp Summersault, a camp for young cancer patients and their siblings, my first counselor was Emily. I adored her. She was so much fun to be around, and she even came to see me perform in the Nutcracker and other ballets several times. This is not that Emily. In fact, this roll is not named for any Emily I know. Rather, it is my take on a roll of the same name that is from the menu of Tex Wasabi’s, a Californian BBQ and sushi restaurant co-owned by Food Network star Guy Fieri. Not only is the roll beautiful in presentation (it’s so colorful! ), it is also delicious. It starts out rich and salty from the smoked salmon on the outside, and the tobiko that the sushi was rolled in pop in your mouth. 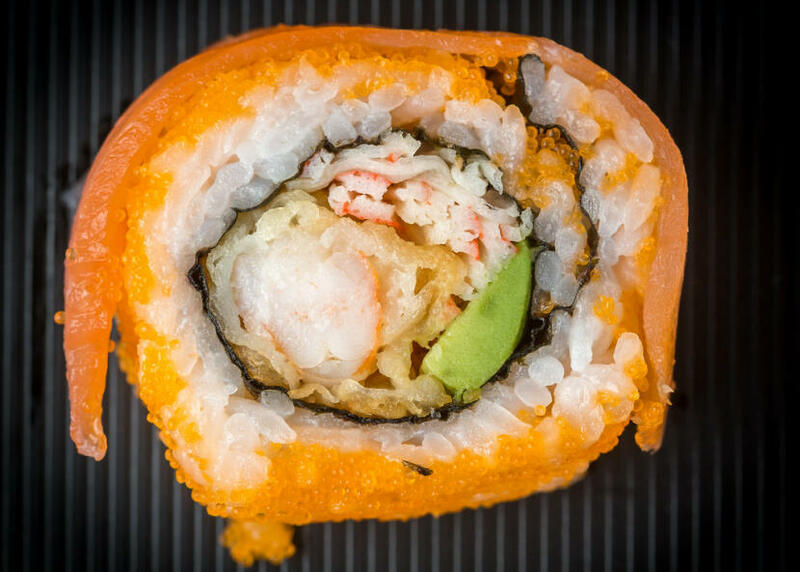 Once you get to the center, it is smooth, creamy, and a little crunchy from the tempura. In other words, delicious, delicious, and more delicious. Bake tempura shrimp as directed on the package. I used this tempura shrimp, but Iâ€™m sure other types, or even homemade tempura shrimp will work just fine. You can also fry the tempura shrimp if you choose, but baking it is healthier, and you can prepare other things (such as the sumeshi) while itâ€™s baking. Mix the mayonnaise and imitation crab. When you lay the sumeshi on the nori, press tobiko into the rice before flipping it over. 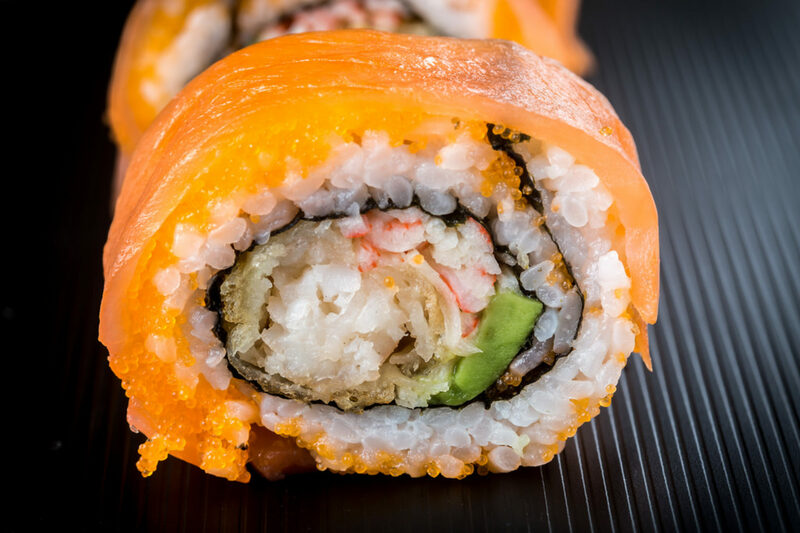 Roll the sushi inside-out, using two pieces of tempura shrimp, a few sticks of avocado, and some imitation crab mix as your fillings. Cover the roll with smoked salmon, and use the rolling mat to press it onto the roll. This looks so good. I have a question about tobiko though. How long does it keep once you’ve opened the can/bottle etc? The containers I have found are too large (1 1/2 cups at least) to use in one sushi making session, especially if making rolls for one person. And it’s most definitely *not* named for my cousin Emily, who is a bitter and mean-spirited girl, and always has been. No one would name anything so gorgeous and amazing in her honor! Fascinating roll…too bad no one makes veg smoked salmon; I can get everything else! Lara – Tobiko can be frozen in a sealed container for 4-6 weeks after you open it. Without freezing, I would eat it within a week, as long as you keep it refrigerated. Yvo – The oriental grocery store I found the tobiko and masago in also has them in those deli style plastic containers. One of the fish roes is in a container twice the size of the other … I’m trying to remember back and it’s probably the one with the larger sized eggs in the larger container. But I could be wrong. All my life I thought sushi was disgusting, but then over the past two years I’ve lived near the ocean and have discovered that sushi is actually super yummy! I’m still iffy on seaweed, so rolls don’t thrill me that much, but this recipe and your description of it has me wanting to change my mind. Maybe if I make my Escaping Reality character eat more seaweed, I’ll be inspired to in Real Life. It is, I’ll bet you’d love it. I love this recipe, but I love the “…this is not that Emily” structure to you’re post even more! I was just reading an article how the tobiko you get in restaurants usually ISN’T very fresh. Ewwwww. That almost ruins my love of all things sushi. But not quite. I’m kinda getting into sushi STUFF lately… found some cool stuff at the shop Baloney Sandwich â€” sushi journals, sushi clocks, sushi magnets, sushi shirts… kinda loving their designs of I Heart Sushi (spelled out of sushi) and Sushi Maki Me Happy. Ha ha ha!